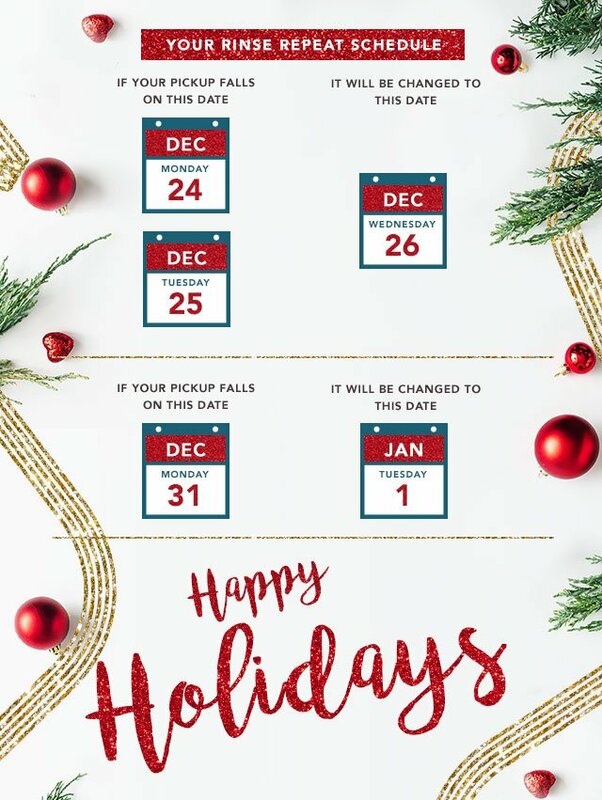 2018 Holiday Schedule - Boston, Chicago, San Francisco, and Washington, D.C.
Chicago, August 22, 2017 /PRNewswire/ -- Rinse, Inc., the fastest growing national brand in dry cleaning and laundry delivery, today announced that its service is now available in Chicago. In June, the company announced its plans to expand into at least 10 new cities following its Series B financing; Chicago is the first of those cities to launch. Rinse is looking to hire a robust team of operations personnel and Valets, in addition to partnering with local dry cleaning and wash and fold establishments. 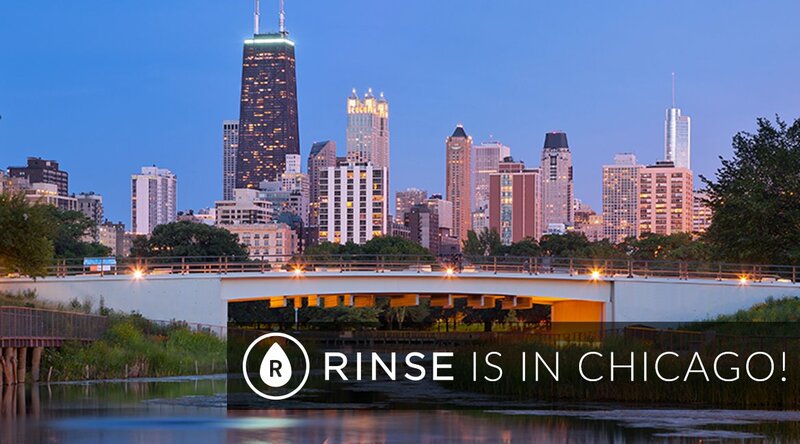 Rinse’s Chicago operation is based in Bucktown and the company is looking to expand its local team of operations personnel and Valets, all of whom are W-2 employees. “Rinse Valets and our local operations teams are core to the customer experience,” said Prakash. “As we look to aggressively grow in Chicago, we want all employees to know that they have an important impact on the business.” In addition to hiring local talent, Rinse is focused on establishing partnerships with Chicago cleaning vendors. At a time when traditional dry cleaners and wash and fold establishments have seen business decline, Rinse is looking to partner to drive incremental business beyond the traditional walk-in customer. The company is already working with several local partners and plans to partner with more as demand grows. Rinse is building the first and largest national (and global) brand in clothing care. 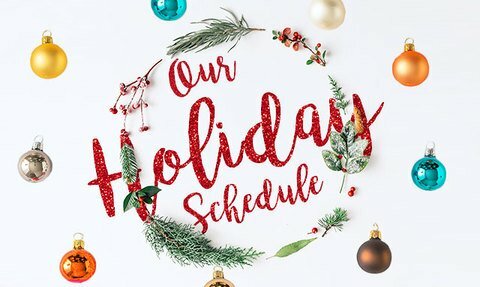 It is addressing a massive consumer problem and creating a significantly better (and more standardized) dry cleaning and laundry experience through the combination of "smart scheduling" and best-in-class quality, all supported by a strong technology backbone that allows it to effectively manage the operational complexity that comes with scale. Its services include Dry Cleaning, Launder & Press, Wash & Fold, Hang Dry, Repairs, Leather Cleaning, and it even takes Clothing Donations. The company was founded by Ajay Prakash and James Joun and is headquartered in San Francisco. To experience Rinse for yourself, please visit www.rinse.com or download the Rinse mobile app (available on iOS or Android). 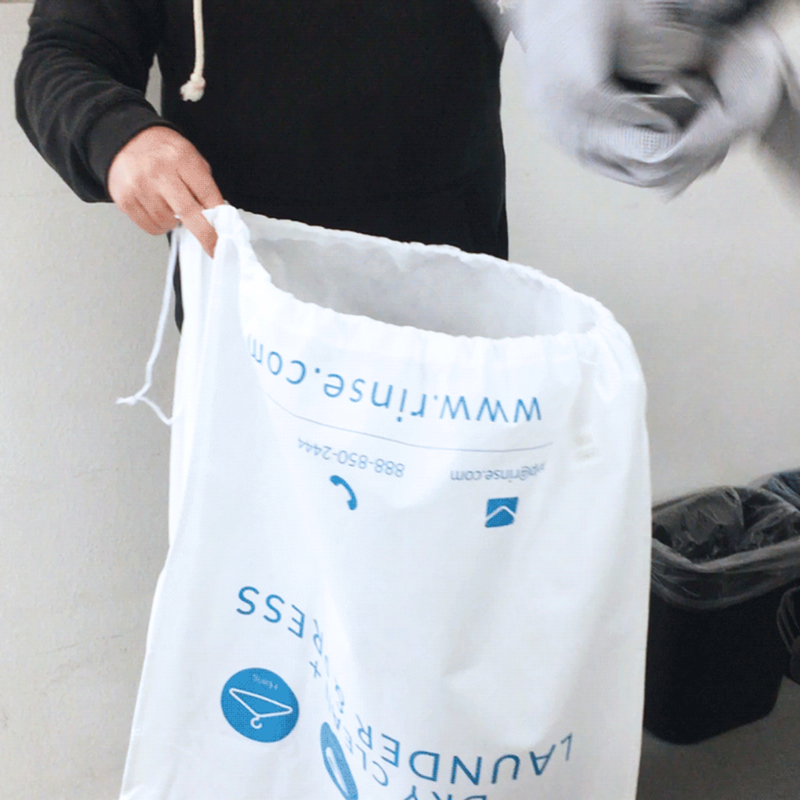 We’re always working hard to make your Rinse experience even better, and that includes the bags that your clothes are picked up and delivered in. That’s why we’re excited to introduce our new Rinse garment bag, which will replace our current Dry Clean/Launder & Press bag (the white one). 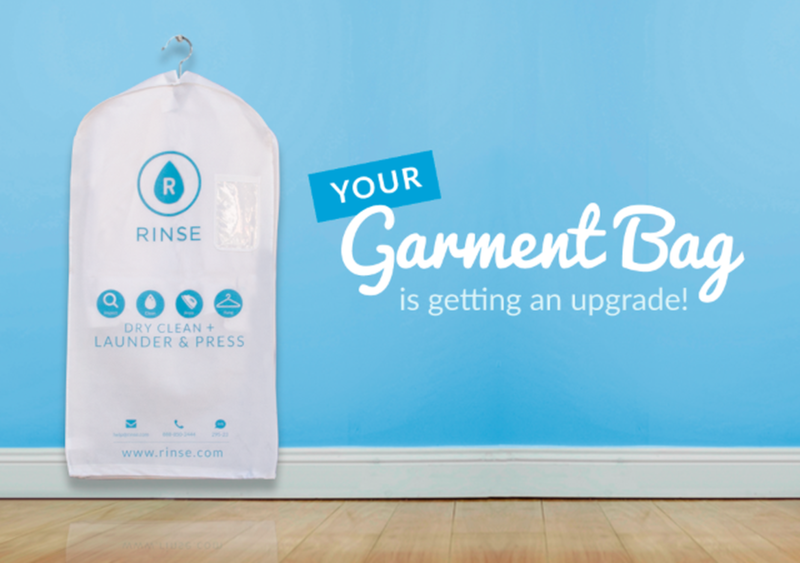 The next time you get your Dry Cleaning done with Rinse, you can expect to receive your clean clothes delivered in one of our new garment bags. The best part about this new bag? It doubles as the bag you’ll fill up with any dry cleaning to give to Rinse. Just flip the bag upside down, fill it up with any clothes you need to get dry cleaned, pull the draw string, and give it to your Rinse Valet when he comes to pick up your clothes. Your clothes will be cleaned, pressed, and returned hung in the garment bag. Moving forward, anytime you need to get Dry Cleaning done, this will be the bag to use. Wondering what to do with your old Dry Clean/Launder & Press bag? Once you’ve a received a new garment bag, just give your old bag to your Valet and we’ll recycle it. Clothing care has always been full of friction (so much so that we refer to it as “death by 1,000 cuts”). Customers are held hostage to proximity when choosing a cleaner and can’t assess quality until after they get their clothes back; cleaners only operate during business hours, making dropping off and picking up very difficult tasks; and there’s limited customer service, technology, and transparency. Heading to the laundromat is no picnic, either. When we started Rinse in 2013, our main objective was to remove those friction points and solve a chronic pain point for our customers. A lot has changed at Rinse over the past few years, but one thing that has remained constant is our unwavering commitment to providing the highest-quality care for your clothing, while delivering a consistent and seamless customer experience. As a consumer service, we know we have to earn our stripes with every order we pick up from you. To do that requires great execution, and great execution starts with the team. Our team at Rinse includes our cleaning partners, our Valets, and our internal staff. They each play a critical role in making sure your clothes always receive the high-quality cleaning they deserve, and you experience the convenience you demand. As we continue to grow, we recognize that the key to our success lies in our ability to ensure that we invest in our team and make sure they have the time and resources needed so Rinse can continue to deliver a world-class customer experience. To that end, today we are introducing a Standard Delivery fee to help support these efforts. Effective with each new order picked up starting this evening (Tuesday, December 13, 2016) we will be adding a nominal fee of $3.99 to be applied upon delivery only (pickups will remain free). If you request Rush Service (e.g., next-day turnaround on Wash & Fold or 2-day turnaround on Dry Clean / Launder & Press), we will add an additional $5.00 charge, which is consistent with how our Rush Service works today. I’m very proud of the service we’ve created and I’m confident that today’s change will make Rinse an even better partner for you by helping us appropriately support the critical components of our day-to-day operations and ensure you receive the highest-quality clothing care and customer experience possible. Thanks for your continued support. We’re working tirelessly to provide the service you deserve for everything in your closet, and we look forward to taking care of you for a long time to come!